In some situations, the end does justify the means. In these anti-political times isn't it useful to remember the positive role political actors can play in making the world a better place? 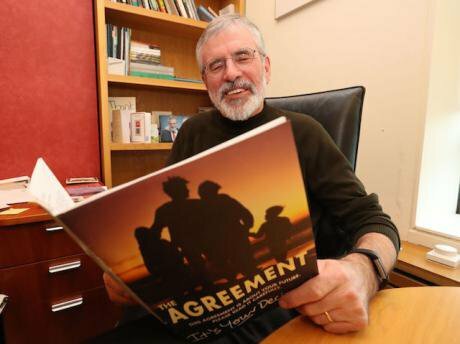 Former Sinn Fein leader Gerry Adams reflects on the Good Friday peace negotiations in his office in Leinster House, Dublin, April 8, 2018. Niall Carson/Press Association. All rights reserved. The war in Northern Ireland claimed approximately 3,700 lives and, by some estimates, injured 40-50,000 people. The Belfast or Good Friday Agreement, 10 April 1998, is the foundation on which an uneasy peace was established. This peace was achieved using ‘honourable’ deceptions, both large and small. This is the ‘inconvenient truth’ of the peace process. Populists argue that ‘a straight talking honest politics’ is possible. Realists claim that deception and hypocrisy is an inevitable part of politics. What is important is to be able to judge between honourable and dishonourable deceptions. In Northern Ireland, the polarisation of the electorate between nationalists, who favoured Irish unity, and unionists who wanted to remain part of the United Kingdom, made the use of deception particularly important in achieving an accommodation. Labour’s Secretary of State for Northern Ireland, Mo Mowlam, pointed out that the Good Friday Agreement was deliberately written to be ‘open to multiple interpretations’. This meant that unionists could argue that it ‘secured the Union’ while for Gerry Adams ‘it severely weakened it’. The Belfast Agreement was designed to climax on Good Friday, 10 April 1998. The symbolism of Easter was used to win support for the deal. The final week of negotiations had been carefully choreographed to give ‘wins’ to all the parties supporting the deal to maximise public support. The US Senator, George Mitchell, had been given a position paper by the British and Irish governments. 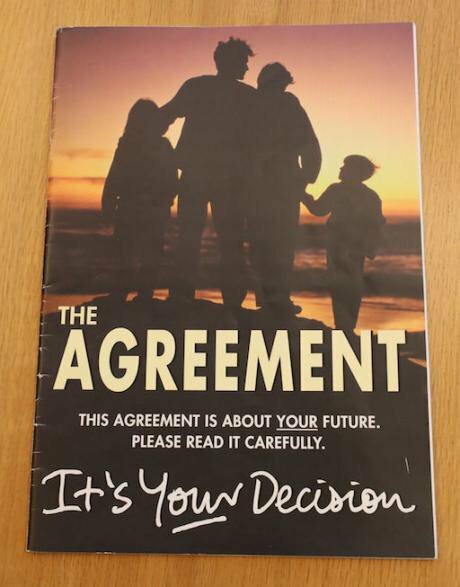 He was asked by the two governments to present this to the Northern Irish parties as his, rather than their, best estimate of where agreement might be achieved. Mitchell realised the paper was too pro-nationalist because of its emphasis on a strong all-Ireland dimension. ‘As I read the document I knew instantly that it would not be acceptable to the unionists.’ But he went ahead with the charade and presented the ‘Mitchell document’ as his own work. The purpose of the paper was, most likely, to create a drama at the beginning of the final week of talks. John Taylor MP, a leading figure in the more moderate Ulster Unionist Party, declared that he would not touch the proposals with a ‘forty-foot bargepole’. Even the centrist Alliance party rejected the proposals. This ‘crisis’ was the cue for the Labour Prime Minister, Tony Blair, and the Irish Taoiseach, (Prime Minister) Bertie Ahern to fly in and take the stage for the final days of negotiation. Blair rejected soundbites but nonetheless ‘felt the hand of history on his shoulder’. The British Prime Minister’s role was to ‘rescue’ the process and reassure unionists that the Union was safe. He rejected ‘Mitchell’s paper’ as too pro-nationalist. The Ulster Unionist Party leader, David Trimble, was handed a unionist victory. Unionists claimed that Blair ‘humiliated’ the Irish Prime Minister. The Irish government claimed Ahern had ‘reached out’ to unionists. Several participants in the talks suspected choreography. Seamus Mallon, of the nationalist Social Democratic and Labour Party, was ‘confident’ that changes to the Mitchell document ‘had been anticipated’. The republican newspaper An Phoblacht reported, ‘The suspicion is that the UUP’s speedy rejection was pre-planned’. The Ulster Unionist Party won their ‘victory’ on the all-Ireland dimension on the Tuesday of Easter week. Negotiations continued, and at 3am on Good Friday morning the nationalist SDLP then won their victory by securing a strong, power-sharing executive. Sinn Fein, the political wing of the IRA, and loyalist paramilitaries secured a ‘victory’ on the release of paramilitary prisoners. Gerry Kelly, from Sinn Fein, approached the loyalists arguing that they should adopt a common front on prisoners, demanding their release within a year. Remarkably, the loyalists argued against one year and insisted on two years. They did so out of concern for the UUP because they believed that David Trimble would not be able to sell an Agreement to the unionist electorate that released all prisoners within a year. Decommissioning had already become they key bone of contention in the peace process. Unionists argued that the IRA should at least start decommissioning to demonstrate their sincerity in entering the democratic process. It was undemocratic, they argued, for republicans to use the threat of violence to extort concessions from the other non-violent parties. The IRA claimed that decommissioning was a humiliating demand for surrender. The UUP rejected the Agreement’s wording on decommissioning because it did not provide strong enough assurances. At the last moment Tony Blair provided a ‘side letter’ to the UUP on decommissioning. John Taylor MP, the Unionist deputy leader, was seen as a unionist hardliner. When he declared that he was now satisfied on decommissioning, this was thought to have reassured some wavering UUP sceptics. Close observers of the peace process have suggested that Taylor played the role of a ‘shill’ or plant. Taylor plays the role of a sceptic who, after the side-letter, ‘buys into’ the deal and this encourages others to overcome their scepticism. This is a charade because all along Taylor was going to endorse the deal because he was allied to David Trimble, the UUP leader. Not all in the UUP were sold on the Agreement. Jeffrey Donaldson MP walked out of the negotiations because he did not believe that the wording on decommissioning was strong enough. He later joined the DUP, which opposed the GFA in 1998, but signed up to a similar deal at St Andrews in 2006. David Trimble later accepted that he had not got strong enough wording in the Agreement on decommissioning. But the alternative to accepting the GFA was for him to walk away from a deal that stood the best chance of bringing peace to Northern Ireland since the violence began in the late sixties. In the Referendum campaign to endorse the Agreement, when it looked like decommissioning was not required, unionist opinion shifted towards a ‘No’ vote. Tony Blair used ‘hand written’ pledges and implied that the GFA required more than decommissioning. This was an ‘honourable deception’. The Prime Minister had good reason to believe that without this deceit the Referendum would fail, and this risked a return to a war. On 22 May 1998 ‘Yes’ won the Referendum on the Agreement. A few weeks later legislation was introduced at Westminster that resulted in the first release of paramilitary prisoners in September 1998. In December 1999, Sinn Fein took their seats in the powersharing executive. The IRA did not begin decommissioning until 23 October 2001, in the wake of 9/11. Political actors used their ‘theatrical skills’ to achieve peace in Northern Ireland. Deceptions both large and small were perpetrated. Hypocrisy was used by actors to present different faces to different audiences. Many of these deceptions were ‘honourable’ because, in some situations, the end does justify the means. In these anti-political times it is useful to remember the positive role political actors can play in making the world a better place. Gerry Adam's copy of the Good Friday peace accord. Niall Carson/Press Association. All rights reserved.